It's been ages and I have been telling myself that I need to jump on the blog bandwagon! What a better way to jump back aboard than to share my own birth story in welcoming sweet little Cece earthside. With my first birth experience I felt I was completely prepared, I knew the risks, interventions and planned to have a natural hospital birth. I did not have a doula, I took a hospital based education course and had a solid birth plan. My pregnancy ended with an induction due to hitting that 42 week mark. Though I felt I was ready I never pictured myself actually having those interventions. Maxed on pitocin (slow progression) and a fluctuating infant heart rate I opted for an epidural at 8cm and pushed/birthed my son fast causing second degree tearing. Though my birth experience was beautiful I felt as though I really was not prepared, I did not know ALL of my options. I went with the flow, I didn't ask questions. My postpartum healing was slow, I struggled with breastfeeding and I dealt with postpartum depression. I knew I was head over heels in love with this beautiful boy but I could not understand why I felt as I had this funk I couldn't get out of. Through my experience I felt a calling and found empowerment through talking with a mama in a local group I had been a part of. We talked about labor support, a doula training was coming to Portland and she suggested I check it out. I did and I was hooked. I knew I wanted to soak in as much information as I could and dive into birth work. I have been through two workshops now (sponsored a second workshop) and I have supported women in birth and postpartum for three years. 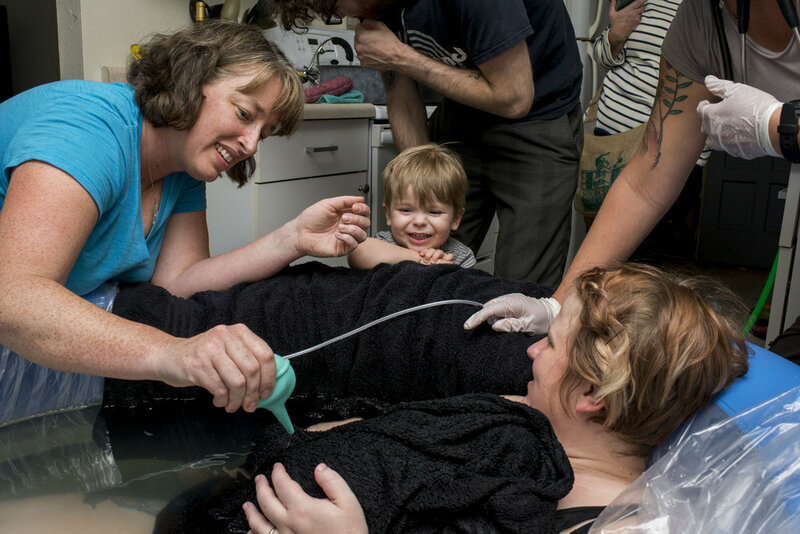 I knew that for my second birth I wanted to have a homebirth, I knew that was the place for me. I feel safe, I feel happy and I feel loved here in my home. In August 2015 we found out that we were expecting again. I connected with an ND in my area, Jill Edwards at Vibrant Family Medicine (SHE IS JUST THE ABSOLUTE GREATEST). Each month my visits were an hour or more, we addressed my well being along with my health. We built upon our birth team at each visit, I wrote down questions, researched my options (doula courses definitely supported my education) and felt confident in our birth preferences. As we approached my estimated due date I admit feeling a little deflated watching that April 1st date come and go, that is where my birth trauma lies. I had an underlying fear that my body just didn't know how to be "On time." I always came back to my birth affirmations, I can do this and my body knows how to birth just as the women before me have given birth. Affirmations written by friends and family were also an enormous sense of support, I hung them beautifully in my birth space and made sure to read them daily. I nested, decorated my birth space with lights (vaccumed and cleaned like a crazy person hah!) and practiced labor supporting stretches and exercises (Miles circuit & spinning babies along with breathe awareness and yoga). Early morning, 3:00am on April 8th I woke to the tightness of a contraction. Having never felt my own body in spontaneous labor I hopped out of bed with excitement. My husband who had been sleeping in the living room due to my late term pregnancy thunderous snoring was hanging out in our living room playing video games... yes we are a house of gamers haha!! I came out to tell him he should get to bed soon as I had a feeling we are in a for a long day. Since contractions were slow, 20 minutes apart I decided to sneak back to bed. Few and far between I would wake up from contractions but I was really able to keep myself comfortable enough to get back to sleep quickly. 5:00am came and we decided to call my mother to come over as my two and a half year old would be waking up soon. We left our plans to keep my toddler home during the birth open ended, he absolutely loves visits from his grandmother and is extremely preoccupied which allowed me to feel as though I could freely labor without a toddler lovingly hanging all over me. I communicated that plans could change with his presence during labor but felt pretty certain I wanted him near. My mother arrived around 8:00am, my contractions slowed to 25 minutes apart. I ate a full breakfast, eggs, toast, apple juice and even cooked for the family (Mamas duties never end right ;-) ) Though my contractions were slow I knew today was the day. I lit my birth candle and posted to facebook- sounds so silly but reading the comments and seeing the flames of other women, mothers and friends that were replied made me feel so supported and united. I checked in with my midwife, we planned that she would come over when contractions were stronger, closer and longer. Because I felt comfortable at home I was able to rest well, eat when I needed and nap. I took several naps between contractions. Around 2:00pm contractions picked up slightly, they were around 10 minutes apart. I asked that my husband start setting up the birth pool so that I could labor if in it if I needed to. My son though occupied would come over to me occasionally during a contraction and ask what is wrong in his own way, "Oh no, what happened?" was the usual. We told him that baby sister is on her way, my mother continued to keep him entertained, reading home birth children's books and explaining sister is almost here! 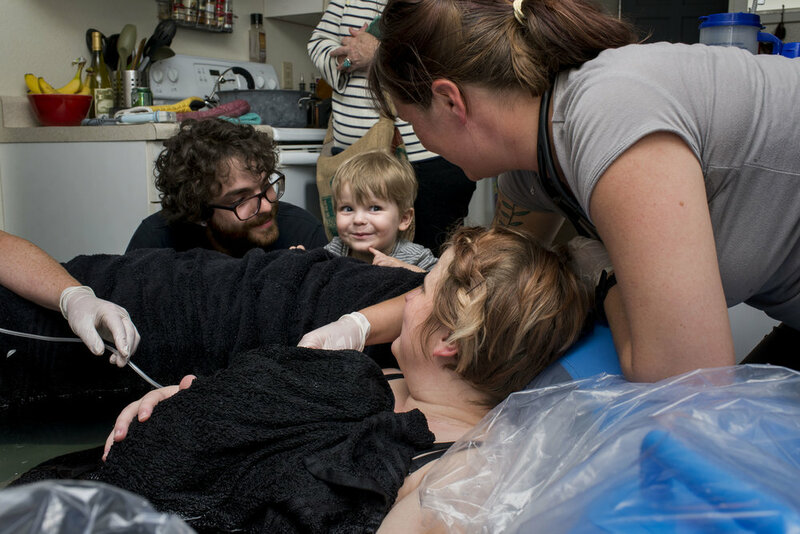 My birth photographer made her way to our house, Rae documented my first birth and I was so pleased to have her capture our second! Contractions really picked up around 5:30pm, 4-5 minutes apart. We connected with our midwife and birth team as it was go time. I rocked on the birth ball, laid in childs position. I listened and allowed my body to give me cues to bring my baby down. When Jill arrived she brought in her team; Emily, and Mia, both are incredible women and so supportive. The team set up shop, listened to baby, provided counter pressure and offered suggestions for positioning. I kept waiting for the pain to get worse, I truly believe that allowing my body to progress and surrendering to the process allowed me to keep calm and experience an enjoyable labor! At around 7:45pm I felt like transition was near, I wanted to get into the water and prepare to meet our sweet girl! Once I got into the water I felt so much comfort and relief. My husband gave me cold wash rags and held my hands, he was so supportive and loving (Yes, even while holding a video camera in his hands hahaha!). During transition I was able to really use the breaks between contractions to fully relax, I consciously told myself to release and relax every muscle in between. Shortly after I felt pressure, the kind of rectal pressure which told me to push. Jill asked to check my cervix to make sure my cervical lip (Scarring from my first birth) had cleared. At that point I had already felt a strong urge to push and felt her starting to crown! I turned over with the help of my midwives and pushed through 2 or 3 contractions. At 8:18pm here she was!!!! In absolute perfection, I welcomed my baby girl earthside and yelled, "I DID IT!" In her sweet compact chunkiness I loved on her and enjoyed all the beauty of immediate skin to skin. Cecelia Rose was here! My son (who was out for a walk with my mother during pushing) came in to see his baby sister, he loved on her and loved on me. The cord was left intact and we allowed the cord to completely stop pulsating before clamping and cutting the cord. Cece had a little excesss fluid in her lungs due to the speed of birth, our midwives provided her with oxygen. She was quite grunty and wasn't improving her oxygen intake. Though her Stats were great we had the conversation of transferring her to the hospital just to make sure she wasn't experiencing a greater issue than just some excess fluid. We were all very calm and extremely confident that she was just perfect but we wanted to have her checked just in case. We easily transferred her to the wonderful Randalls Children's Hospital in Portland. She had an xray where they confirmed our suspicion of excess fluid and it should clear up quickly. We were all thankful for the support of the hospital. Cece received oxygen until the hospital providers were comfortable releasing us to go home. Our sweet baby girl weighed 8lbs, was 19" and perfect. She nursed immediately in the hospital and continued to improve her breathing while skin to skin on my chest. Overall my birth experience was just amazing, I felt my voice was heard from all of the providers I worked with. Wow, I am blessed.